McIntyre has paid for the club's inability to win at home all season and their position four points adrift at the foot of the Clydesdale Bank Premier League. 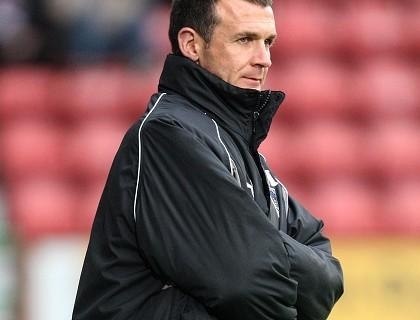 Assistant manager Gerry McCabe will take charge of the team, who do not play this weekend, but Dunfermline have already received expressions of interest in the role. McIntyre led the Pars to the Irn-Bru First Division title despite cutbacks and his debut SPL campaign as a manager has been undermined by lengthy injuries to the likes of Martin Hardie, Kevin Rutkiewicz and Paul Gallacher. Yorkston told the club's official website: "He was a lovely guy and I am really sorry that we had to do it." He added: "The board have decided that it is in the best interests of the club. It was really because of our league position and the home record. "We made the decision at a board meeting on Tuesday night, there were 10 directors present, but we decided to reflect on our decision until [Friday]. "We felt that it was right to take action now while there was still a chance for someone to come in and freshen things up. "We do not have a bad squad, injuries have not helped. We have certainly been the equal of many of our opponents this season but we just didn't get the breaks." Yorkston added: "We will look at folk who might be available instantly, but contractual obligations may mean that we go for a short-term option if the long-term option is not immediately available. "The short-term solution might become the long term one and it will be up to whoever comes in to decide whether they want to retain Gerry's services. "We will weigh up the options, have a chat over them when we know who is interested."